Given that the region is anticipating significant population growth in the coming decades, and that no more land is being created here, we must utilize the existing infrastructure to its maximum capacity. Rather than imagine pie-in-the-sky road projects, let’s envision using the existing right-of-ways most effectively to absorb more means and modes of transportation, including bicycle, bus, tram and pedestrian systems. And the other element of our landscape must also be considered – using the waterways. 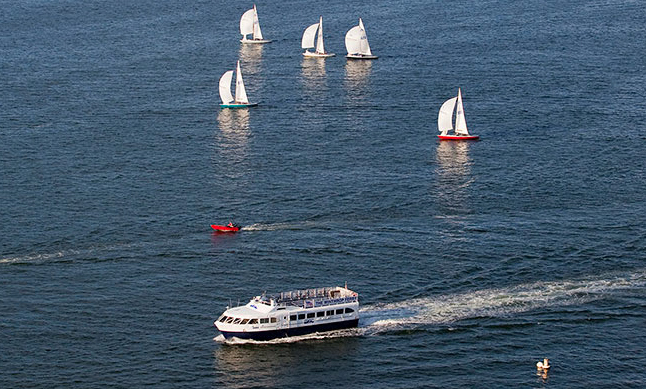 A passenger ferry system is a scalable and comparatively low cost investment public transportation system in an area where waterways provide the connective tissue of the region. Successful examples include Venice’s vaporetto, Brisbane’s CityCat and Vancouver’s British Columbia Ferry Services (over 20 million passengers per year). This particular approach to public transportation would be an efficient and appealing alternative in the Charleston region, accommodating tourists, commuters, and families and seniors seeking recreation and exercise alternatives beyond the environs of the municipalties. The ferry transport pilot project is proposed to extend along the Ashley and Wando River corridors, serving Summerville, North Charleston, Charleston, and Mt. Pleasant, with a total route length of approximately 40 nautical miles. Costs to develop the pilot project include negotiating land use (public and/or private) at each landing; installing a covered pier head and floating dock; and, coordinating the effort with beefier CARTA network connectivity. Each landing also suggests areas for passenger pickup/dropoff (“kiss and ride”), and limited parking facilities. Travel times are estimated to be approximately 35 minutes from the City Marina (Charleston) to the airport and approximately 45 minutes from the Maritime Center (Charleston) to the Highway 41 bridge. The system could be served with boats of differing capacities and intervals based on peak vs. off-peak operations, and also with seasonal schedules for greater tourist loads. Ferry passes would be available on daily, weekly or monthly basis. Commuters could use the route to connect to Boeing facilities in vicinity of airport and employers on peninsula, especially MUSC, College of Charleston and Roper Hospital. Tourist and residents alike would gain access to the airport connection as well as recreation and tourism sites along the Ashley River and the Francis Marion Forest. 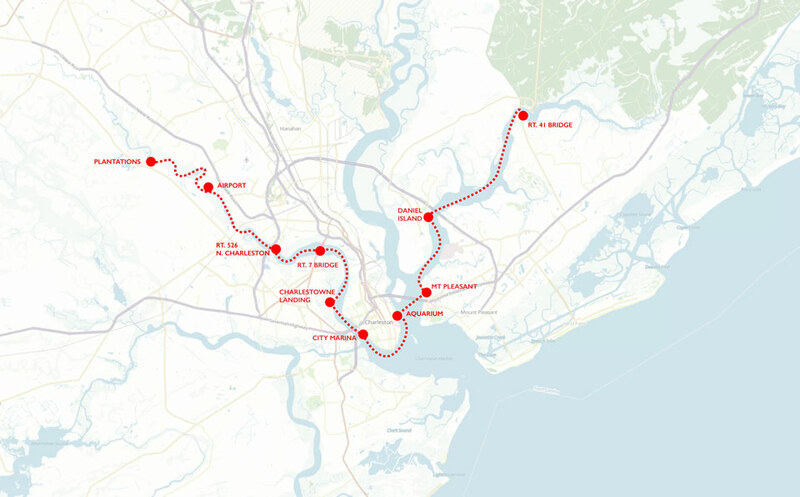 Big hurdles include permitting along the waterway and developing the landing sites, including park/ride facilities and connectivity to bus service. This is a pilot program for a significant component in a regional transportation system. Historic sites linked through CARTA shuttles, including the private plantations, state-owned Fort Dorchester and Charlestown Landing sites, and the federally owned Francis Marion National Forest, realize benefits in terms of increases in visitors, commuters, and recreation users, with the potential to reduce automobile traffic along Highways 61 and 41. How about this! Clockwise and counter-clockwise service at public boat docks and landings from Wild Dunes to Elliott's Cut to Westmoreland Bridge and Daniel Island. Stops at Shem Creek, Ft Moultrie, City Marina, Remley's Point, Wappoo Cut, Dockside, County Marina at old Navy Base, and more. Serving major employment centers like the Medical University, C of C, Broad Street, Westvaco, Shipyard, etc. I'm ready to make a modest financial contribution to help fund a study. CARTA where are you? Great idea… I just posted some additional ideas. Charleston seems like an obvious candidate for a efficient ferry service. Our only water transportation resources are under utilized. Any ferry service has to be faster than the existing bus service, which in the case of the NASH Airport Express, is currently taking passengers from the Visitor's Center to the Airport on 23 minutes for $3. Our rivers curve a great deal as the move inland and our marshed can require very long docks to connect deep water with landside transportation connections. However Daniel Island, a growing part of the city, has no functional transit connection and a conventional small ferry there could get from a dock on a creek off the Cooper River to the Maritime Center (where an existing DASH stop exists) in about 12 minutes. Many elderly residents on Daniel Island moved there on promises of transit or ferry access to Charleston which have never materialized and now find themselves stranded. The distance to cover by water is short, land routes are longer and slower and nearly the entire water route is shielded from open water and rough weather.